Here are all key stats and numbers ahead of the reverse fixture between the Royals and Kings XI. The Rajasthan Royals will take on the Kings XI Punjab on Tuesday in the away fixture coming back of a brilliant chase against the Mumbai Indians. Jos Buttler once again held the key for the Royals with a quick-fire 89. He will be gearing up to take on the Kings XI against whom he was mankaded. This game will be a crucial one for the KXIP who lost their previous two matches. They need to ensure they don’t fade away after a good start as during the previous season. 3 – Dhawal Kulkarni is the only player to dismiss Chris Gayle “bowled” on three instances in the IPL. Gayle scored only 43 runs from 40 deliveries he faced from Kulkarni in the IPL with seven fours and a maximum. 4 – KL Rahul got out to Dhawal Kulkarni on four instances in the IPL including the first games between the two teams this season. Rahul scored 32 runs from the 22 balls he faced against Kulkarni. 4 – Jos Buttler has scored fifty in each of his previous four innings in the IPL against Kings XI Punjab. He has scores of 69, 82, 51 and 77 in his previous four innings against KXIP while opening the innings. Only David Warner (7 against RCB and KXIP) has more fifty-plus scores in a succession against an opponent in the IPL. 7 – Ajinkya Rahane has a batting average of seven in the IPL against Ravichandran Ashwin. Rahane scored only 28 from 30 balls against Ashwin in this league and got out on four instances to the off-spinner. 52 – Jos Buttler has a batting average of 52 in the IPL against the Kings XI; the 4th best among the players with 300+ runs against them. He scored 312 runs across six innings in the IPL against KXIP at an S/R of 156 with help of four fifties. 55.75 – KL Rahul’s batting average of 55.75 against the Rajasthan Royals in the IPL is bettered by only two players. 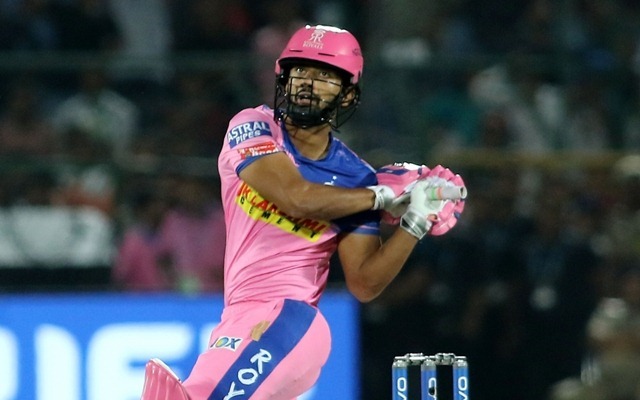 (Among the 30 batsmen with 200+ IPL runs) Rahul scored 223 runs across six innings against RR including two unbeaten fifties in 2018. 204 – Rahul’s batting strike-rate against Jofra Archer across the two matches during the previous edition. Rahul scored 51 from only 25 deliveries he faced from Archer by hitting four fours and three sixes without getting dismissed. 272.72 – Chris Gayle has a strike-rate of 272.72 against Jaydev Unadkat in the IPL. Gayle smashed 60 runs from 22 deliveries against Unadkat with six fours and four sixes without being dismissed. KL Rahul also scored 46 runs off 27 balls he faced from Unadkat without getting out in the IPL.